About a year ago, I was lounging around the periodicals section of Sterling Public Library, awaiting a mechanic down the road to finish replacing at oil gasket on my car. I plucked magazines from the rack like apples, examining them quickly and then setting them aside, as though they were full of worms. I couldn’t find many articles of interest. Then an item in The Atlantic’s table of contents caught my eye. “Why Are All the Cartoon Mothers Dead?” it asked. I flipped to the article and read with interest. (You can click the link above to read it as well — it’s long, but interesting.) One of the nuggets I absorbed from it is that in children’s storytelling, moms are essentially spoilsports. Yup. We women are the enemies of adventure. We want to tuck our children safely into bed at night, not let them go on wild, hair-raising, dangerous adventures. Mothers are boring. Fathers, on the other hand, get a pass because they apparently aren’t as careful or attentive with children (specifically in Disney and Pixar films), and sometimes dads join the fun and adventure. I understand now why so many fictional kids are orphans. The existence of parents throws a monkey wrench into an efficient plot. By protecting their kids from danger, they stave off adventure. It would be simpler to dispense with them altogether, and maybe that’s easier to do if you aren’t a parent yourself. The Sarah & Katy books buck the absent mother trend, but only slightly. Their mother is alive and well throughout the books, but it’s also true that she’s absent during their adventures. Katy and Sarah imagine themselves to fantastic places where they can have adventures away from the watchful eyes of their mom — in fact, in Sarah & Katy and the Imagination Blankets, Katy specifically imagines a land without grown-ups after she gets angry that their mom grounded them. 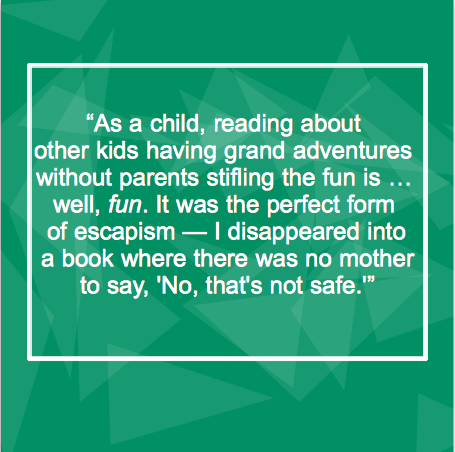 As a child, reading about other kids having grand adventures without parents stifling the fun was … well, fun. It was the perfect form of escapism — I disappeared into a book where there was no mother to say, “No, that’s not safe.” I broke all the Hogwarts rules with Harry Potter. I visited other dimensions and planets with Meg Murry (whose mother was alive, but not in the adventure for Meg and Charles Wallace to rescue their father). I followed Dorothy to Oz. There’s a Rubicon you cross when you become a parent. Your emotional viewpoint shifts, and you start identifying with the parents in stories, rather than with the children. That’s a good thing — it’s hard to make rational decisions as a parent if you identify too completely with childhood hurts and desires. But if you don’t have kids, or until you do, you tend to identify with the children in any story. I put this to the test recently. For the first time in eight years, I decided to reread the Harry Potter series. The final book came out between my sophomore and junior years of college, when I was still a pseudo-adult. Although I was 20 years old, I was still living at home with my parents and read the series through the eyes of a child more than an adult. I’m about halfway through the third book, Harry Potter and the Prisoner of Azkaban. While I still immensely enjoy the books, there is a noticeable shift in my attitude. Rather than associating best with adventurous and rule-breaking Harry, I now associate best with Hermione, who is the voice of reason and a bit of a nag when Harry is trying to break rules. There was a catch in my throat at the end of Chamber of Secrets, when Molly Weasley sobbed with joy at discovering her daughter, Ginny, had been rescued and not killed. And I’m starting to get tired of the repetitiveness of Harry’s rule-breaking. Internally I find myself groaning, Seriously, Harry? Just go to Dumbledore and avoid all the danger and drama. But that’s not the point of the series. It would make for boring reading to have Harry go to Dumbledore and the resolution of every book to be, “And Dumbledore fixed the problem and the rest of the school year was uneventful.” I recognize that, which is why the books are still entertaining and enjoyable as an adult, even if I connect with them differently than I did in the past. The basilisk was moving toward Harry; he could hear its heavy body slithering heavily across the dusty floor. There was a loud, explosive spitting sound right above him, and then something heavy hit Harry so hard that he was smashed into the wall. Something very hard and heavy thudded onto the top of Harry’s head, almost knocking him out. Apparently everything inside the Chamber of Secrets was heavy. As a young reader, I was so caught up in the action I never noticed the writing. Now, awkward phrases or repetitive writing hit the brakes on the flow of the story. Although perhaps I notice it now not because I’m an adult but because I’m a writer. I was pleased when a reader in an online book club reviewed Sarah & Katy as a book both children and adults would enjoy. A mother gave the story a gold star for being entertaining for adults while still being written at a children’s level. I wasn’t surprised, though. I grew up in a family that appreciates kid lit — whenever my sister and I brought home Hank the Cowdog books from the school library, Dad would read them before we returned them. He appreciated them from a different angle, though — we had two Labs growing up that were just as bumbling as Hank and Drover. While we were reading them to see life through Hank’s point of view, Dad was reading them as near-satire from the view of being a dog owner. One more benefit to reading kid lit as an adult: The nostalgia is priceless. Each time I open The Last of the Really Great Whangdoodles and read a few passages, time rewinds. I get a strong sensation of late afternoons, warm breezes, and reading while swaying on my childhood rope-and-plank swing, which hung from a branch of the blue spruce in my parents’ backyard. I can almost hear the huffa huffa panting of my childhood dog lying on the grass beside me. And I get that quiet longing in my chest once more, that silent wish, If only I could imagine strongly enough to transport myself to Whangedoodleland. When I put the book down, nostalgia hasn’t entirely faded. I almost expect to see my parents’ backyard stretched out ahead of me, where I will set the book aside and run off to imagine myself traversing Whangdoodleland, or perhaps Oz, or Hogwarts. But I’m only standing at my bookshelf, and the nostalgia passes, and I go about adulthood once more. But the day is just a bit more magical, and childhood doesn’t feel so many years away anymore. All because I dipped my toe in a bit of kid lit. This entry was posted in Reading and tagged children's books, children's literature, Harry Potter, kid lit, reading, writing. Bookmark the permalink. September 9, 2015 at 9:57 p.09. September 14, 2015 at 9:57 p.09. September 13, 2015 at 9:57 p.09. This is a wonderful post! I am very much looking forward to reading Sarah & Katy and the Imagination Blankets. I also agree with you and Julie about the repetitiveness of words as well as actions by characters. I read a wonderful nonfiction about an author’s journey through Europe, but the continual use of the word “infer” drove me crazy. Especially when a thesaurus is easily accessible on the internet. Thank you for sharing you thoughts on the hop! Thanks for visiting my blog, Stacie!